Kakapos - the world's fattest species of parrot - have had their most successful breeding season on record, according to New Zealand's Department of Conservation (DOC). The flightless, nocturnal parrots were once one of the country's most common birds, but only 147 adults are left. This year, 76 chicks have been hatched under the DOC's conservation scheme, with 60 expected to reach adulthood. The new batch is more than double that of the last breeding season in 2016. Kakapos only breed every two to four years when their favourite fruit grows in New Zealand's Rimu trees - the period is known as a "mast year". Their numbers have also been curbed by hunting, deforestation, and predators like stoats which were introduced by European settlers. One scientific advisor to the DOC, Dr Andrew Digby, says scientists have seen bumper quantities of fruit on Rimu trees in recent years, an occurrence possibly caused by climate change. 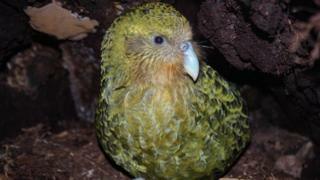 With so much fruit, many female kakapos have bred earlier and, in some cases, laid two clutches of eggs. Until the 1970s, kakapos were thought to be extinct but a group was discovered on Stewart Island, south of the country's South Island. Just 18 were known to exist by 1977, but New Zealand's DOC has spearheaded efforts to boost its population on two remote, predator-free islands. Under the scheme, all newborn kakapo chicks are raised in a secure facility and later released into the wild, tagged with a transmitter. Each parrot also has its nest fitted with sensors and cameras, and is given a tailored diet via nearby feeding stations. "They don't get a lot of privacy," Dr Digby said. "I can log online and see what they're doing, see who they've mated with, how long for, and even the quality of the mating. "It's probably one of the most intensively managed species in the world, certainly in New Zealand." To raise awareness of the bird and the DOC's work, the department hosted a "chick viewing session" earlier this month. The DOC also has an "advocacy" kakapo, named Sirocco, who tours the country as an Official Spokesbird for Conservation. "People fall in love with them," said Dr Digby. "They don't behave like a bird, they're a little bit human. "They even look like a grumpy old man and they all have different personalities," he added. Looking ahead, Dr Digby said the DOC wants to see population levels hit 500, but is "continually attempting to back off, with a bit less intensity each breeding season." "The aim of our programme is for every child to grow up knowing what a kakapo is, just like an elephant or a lion."